FELT AT SEA creates individual textiles and accessories for life! Using a variety of craft skills and a range of fibres FELT AT SEA produces one-off pieces, from chic hats to deep sea caves! All the work is original and varies depending on materials available and inspiration received! Every item is individually hand crafted and finished to a very high standard. 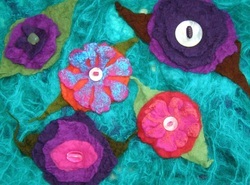 Felt Making is a speciality! FELT AT SEA produces both two and three dimensional work; paintings made in felt are framed behind glass ready to hang on the wall. In three dimensions, cloche hats are a favourite, plus other essential accessories such as scarves and brooches. 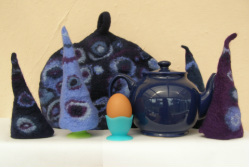 FELT AT SEA also creates art works with felt - pots, vessels, and flowers. Each piece, be it hat or pot, is carefully engineered from one single piece of felt – seamless and unique. Every item is handmade, given the utmost attention to detail and finished with great care. FELT AT SEA is accredited under the Made in Cornwall Scheme. 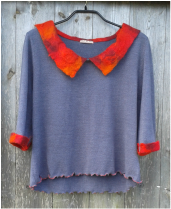 FELT AT SEA often works to commission and this can involve using specific fabrics or colours as well as creating made-to-measure pieces such as hats and outfits. To commission a piece of work, or find out about courses; phone Charlie on 01736 811288 or email charlie@feltatsea.co.uk. I hope you enjoy browsing through my collections and if you are interested in anything please feel free to contact me and see if you can't find something lovely to keep, or give to a friend or loved one.